If you live in the USA, chances are you’re celebrating Thanksgiving this week. Happy Thanksgiving to you! Regardless of where you live, we’re entering a festive holiday season. Hanukkah. Christmas. Kwanzaa. Festivus. New Year’s Eve. That means parties, feasts, and seasonal foods. What does this bring to mind for you? Do you think any of these thoughts about holiday eating? 1. I only get to eat (fill in favorite holiday foods here) on (insert holiday here)! I’d better eat enough of it while I can! 2. There are so many tempting foods around. How can I resist? 3. I can’t waste this, so I’d better finish what is on my plate. 4. After the holidays, I’ll go on a diet. 5. I deserve to eat this! What is wrong with this type of thinking? It comes from mindset of scarcity. What if you approached the holidays with a different mindset? 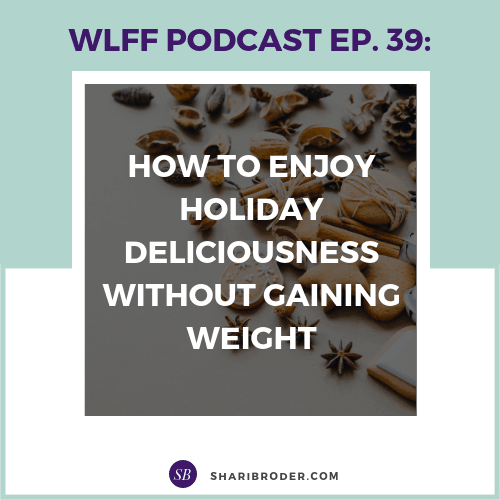 Listen to learn how changing your mindset can make all the difference in whether you overeat and gain weight or enjoy your holiday favorites even more without gaining an ounce! What? You don’t get my emails? Sign up for weekly inspiration at the link below and get 8 Secrets for Permanent Weight Loss for free.